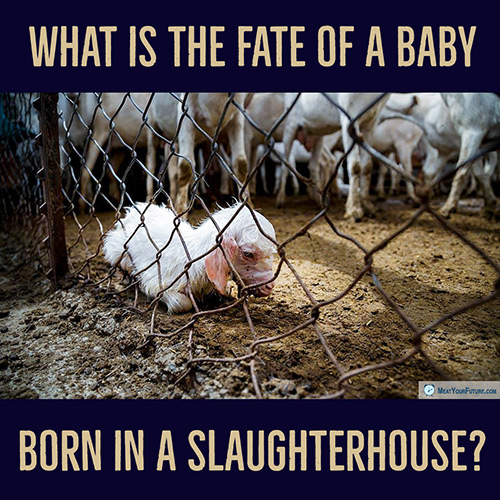 What is the Fate of a Baby Born in a Slaughterhouse? This baby goat was born in the holding area of a slaughterhouse, where she was apparently killed, along with her mother. Is that surprising? It shouldn’t be. This is the fate of *all* animals used for food. Whether they are from a factory farm, or from a small, local, family-owned, supposedly “humane” operation – they all endure a premature and violent death. If this baby had been born before her mother was transported to the slaughterhouse, she would still have had her one and only precious life taken against her will. You may not picture this baby goat when you order goat cheese or lamb chops, but horrific suffering of vulnerable animals is unavoidable whenever we use living beings as commodities. The good news is that we do not need to consume any animal foods to be healthy, and, in fact, we are even healthier by avoiding them. So we have no excuse to impose this harm and death on any sentient animals, including this baby goat. Please understand the serious implications of your food and consumption choices, and go vegan. And please do whatever you can to help raise awareness of these issues. Do You Think Animals Don’t Feel Pain?